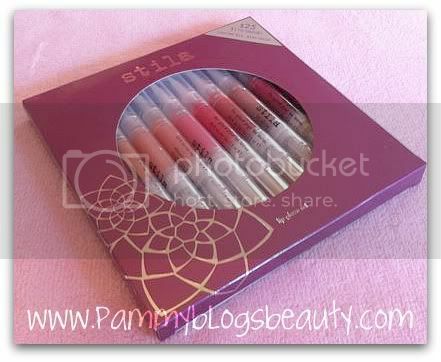 I am so happy to be reviewing this special Holiday item: The Stila Lip Glaze set. I passed up on purchasing this for myself last year, and was just kicking myself when it ran out of stock before I could pick one up for me (But, I gave one away in my blog giveaway last year!). So, when I saw these available on the Birchbox website, you know I had to get one right away! 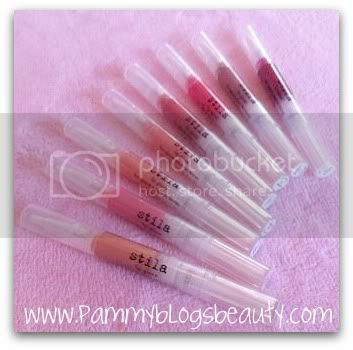 Stila Lip Glazes have always been some of my very favorite lipglosses!!! They are just so pretty and easy to wear. Would you like to hear more about this set? Keep reading! A holiday favorite; this limited edition collection contains our best-selling lip glaze in eight exquisite shades. The set includes four top-selling shades and four limited-edition shades. Honestly ya'll, you can't beat this deal with a stick! The value is incredible! This entire set is only $25.00. 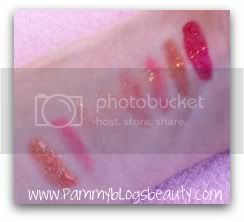 That is a fabulous deal for 8 Stila glosses! Normally, a Stila Lip Glaze goes for $22.00 for a .08 fl oz tube. The tubes in this set are .05 fl oz. Plus, you get fabulous best selling shades AND limited edition shades. This set is great for gifts or for a treat for yourself! I mean, after all, what girl (of any age) does not adore lipgloss! I love that there is a great range of shades in this collection: sheer, dark, nudes, pinks, sparkle...a nice variety (see swatches below)! They all have a fabulous high gloss finish and are not overly sticky. They feel so nice on the lips! I am absolutely thrilled with this purchase! It is a perfect "gift for yourself" or for any lipgloss or makeup lover in your life! The shades are all so lovely and wearable. They would flatter pretty much any skintone. A great gift for 2011 for sure! Did any of ya'll pick this up this year? What Holiday Sets do you have your eye on? Thank you for reviewing Pammy, I like Stila also but did not get this one.